That’s what is written at the beginning of the CIA Library page devoted Doctor Zhivago. In 1957 an operation was launched to publish and spread among the Soviet citizens a Russian-language edition of one of the most explosive works of Boris Pasternak. I cannot say that I knew the full story of Doctor Zhivago and its different editions. Yes, I know some of the book’s history and the Nobel Prize nomination. However, the fact there were not one but two editions sponsored by CIA, one of which was published under the guise of a fake publishing house? That was new to me. Most of the novel was written between 1945 and 1955. However, there are passages dated back to 1910s and 1920s. The novel is named after its protagonist, Yuri Zhivago, a physician and poet, and takes place between the Russian Revolution of 1905 and World War II. It was deemed anti-Soviet by the authorities and multiple members of the public. Pasternak was rejected when he tried to submit the novel to the Novy Mir, one of the prominent Soviet monthly literary magazines. However, an Italian journalist Sergio D’Angelo, sent by the Italian Communist Party, found out about the novel and offered Pasternak a chance to publish the book in Italy on behalf of Giangiacomo Feltrinelli, a publisher from Milan. In 1957 the novel was published by Feltrinelli in Italian. In 1958 the Russian text had fallen to the hands of the CIA operatives. That’s how the story of the first Russian edition of Doctor Zhivago starts. A memorandum shows that CIA considered the novel to be the most powerful literary work created in the countries of the Soviet Bloc. That lead to some crucial decisions, including the need to publish Doctor Zhivago in as many languages as possible, and to carefully choose the publishing house for the Russian edition of the book so that the ideological warfare wouldn’t taint it. A concern for the author’s well-being was also stated in the memorandum. That, however, didn’t help Boris Pasternak. 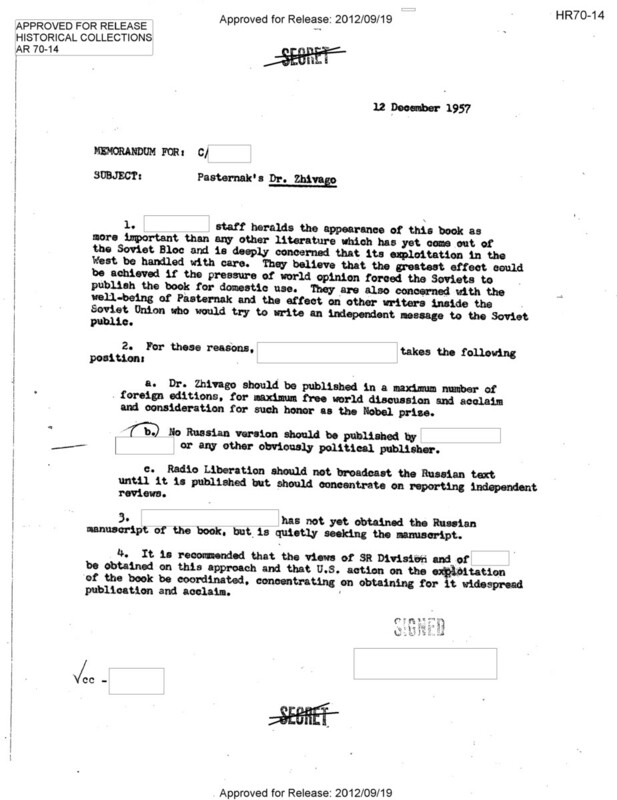 At the moment of signing of the memorandum on the 12th of December, 1957 CIA haven’t yet obtained a copy of the text. They have achieved that goal sometime later with the help of the British intelligence agency MI-6. However, the details of this operation are still secret. The first Russian edition of Doctor Zhivago was prepared with the help of the Dutch colleagues of the CIA. In September 1958 an agent of the secret service of the Netherlands Joop van der Wilden organized the printing of the book by Mouton Publishers (today the company’s name is De Gruyter Mouton) in the Hague. 10,000 copies were printed by the Dutch publishing house. A thousand of which were sold off the press to the CIA at a discounted price. The plan was to distribute some of the copies among the visitors of the Expo 58 in Brussels. Other almost 500 books were given to the CIA operatives in Frankfurt, Berlin, Munchen, London, and Paris. There were reports that the blue covers of the first Russian edition of Doctor Zhivago had littered the area near the Vatican pavilion, where they were distributed. People didn’t want to have something so discernable in their luggage. Books without covers could have been smuggled back much easier. That’s why, I guess, an intact copy of the first edition has an estimate of £4,000-6,000 at tomorrow’s Christie’s auction. Updated 28.11.2018: The book was sold for £22,500. There are multiple consequences to the publishing of Doctor Zhivago and publishing of the novel in the Russian language. Samizdat and tamizdat (the latter one refers to the books published outside the Eastern Bloc and smuggled in) are considered to be one of the many instruments that made the Soviet Union crumble. For sure, Pasternak’s novel was one of these tools. Feltrinelli had sued Mouton Publishers for the copyright infringement. However, CIA had helped the publishing house to work out the issue. Even while Pasternak’s nomination for the Nobel Prize was discussed every year from 1946 to 1950, it may be that without the Italian edition of the novel there would have been no nomination in 1957, and no Nobel Prize for the Soviet author in 1958 without the Russian version printed in the Netherlands. The award resulted in a hate campaign among many strata of the Soviet reality. On the same day Pasternak has sent the telegram, the Literary Institute in Moscow demanded that all its students sign a petition denouncing Pasternak and his novel. On the 26th October, the Literary Gazette ran an article by David Zaslavski entitled, Reactionary Propaganda Uproar over a Literary Weed. This hate campaing was so overwhelming, that there still is a humorous Russian saying, “I haven’t read Pasternak, but I condemn him.” However, it was very serious 60 years ago. Even after Pasternak has announced his decision to decline the award, there were motions to deport him from the USSR and maybe to revoke his Soviet citizenship as well. And here is the book that made me to dive into the details of the publication of Doctor Zhivago. CIA didn’t stop with the first edition, and in 1959 they sponsored a second Russian. It was printed under the guise of a fake French publishing house Société d’Edition et d’Impression Mondiale, Paris. 9,000 copies of the novel were printed in a soft-cover pocket format for the easier distribution. 2,000 copies were given to students from USSR, and other Soviet Block countries at the 7th World Festival of Youth and Students in Vienna. Among the books of other authors, including George Orwell, James Joyce, Ernest Hemingway, and Vladimir Nabokov. To mention the monetary aspect of my story, the two volumes of the second Russian edition cost me only 2 Euro. Yes, sometimes you get lucky at these book markets. Even if the real market price for these books is not as high as with the first edition with an intact cover, it still can go as high as several hundred Euro. However, as with many other old books I found at the book markets all over the EU in the months since moving to the Netherlands, even more important to me is not the price of the book, but its story, and the opportunity to share the details of this spy story with the readers of iBookBinding. By the way, my copy of the book belonged to one Wilfred Oranje. I guess that’s the one. A Dutch translator who mainly worked with German and Italian texts but was known to study the Russian language at one moment of his life. Boris Pasternak has died on the 30th of May, 1960, at the age of 70. On the 31st October of 1958, he was denounced as an internal White emigre and a Fascist fifth columnist by the Union of Soviet Writers. Afterward, the attendees announced that Pasternak had been expelled from the Union. The author was rehabilitated by the Soviet authorities only in 1987. Doctor Zhivago was first published in the Soviet Union in 1988. Ironically, by the same magazine Novy Mir that declined the printing more than 30 years before that. Until 1989 there was no mention of Boris Pasternak or his works in any Soviet schoolbooks. ‹ How I Found a Composing Stick (and Much More) in Copenhagen › Next Destination: Bookish Ireland!